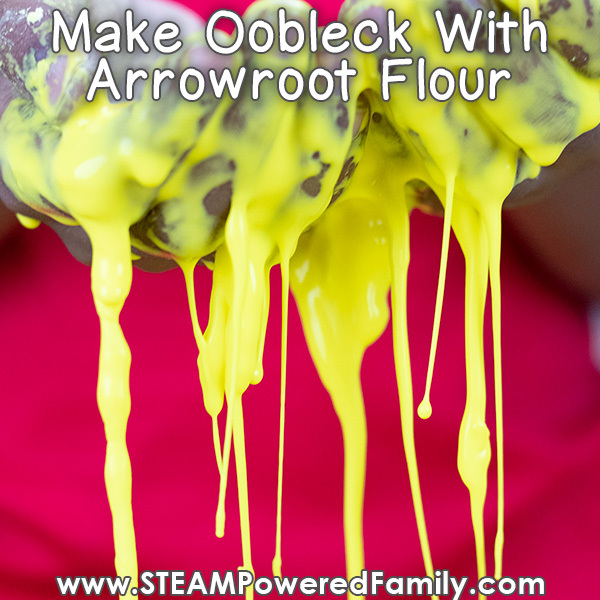 Oobleck is a fascinating substance that makes an exceptional choice for a science fair project, especially when you consider that there are so many recipe variations to explore. 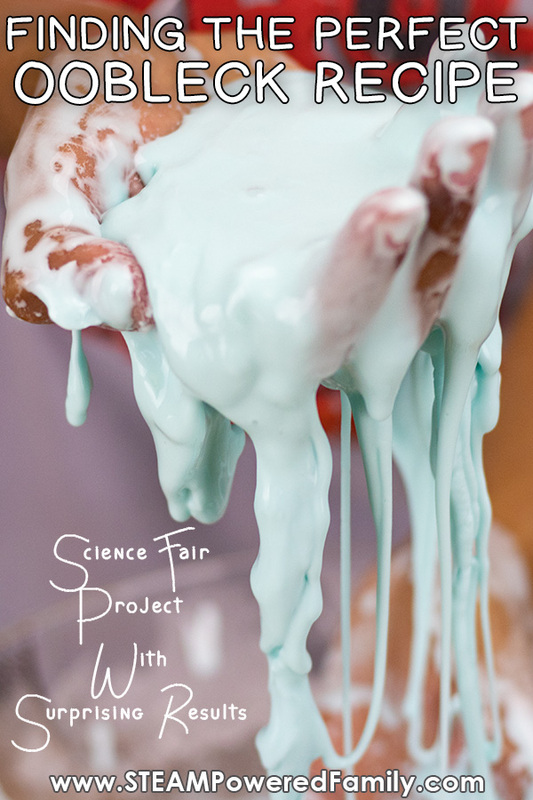 In this science fair project we test a number of ingredients and recipes to see which one makes the best oobleck, and you will be surprised by our results! We love a good science fair project. It makes a great learning experience where we can dive deep and explore some fascinating scientific principles. Oobleck is one of our favourite things to study at the moment. We have already done two really fun science investigations using oobleck. 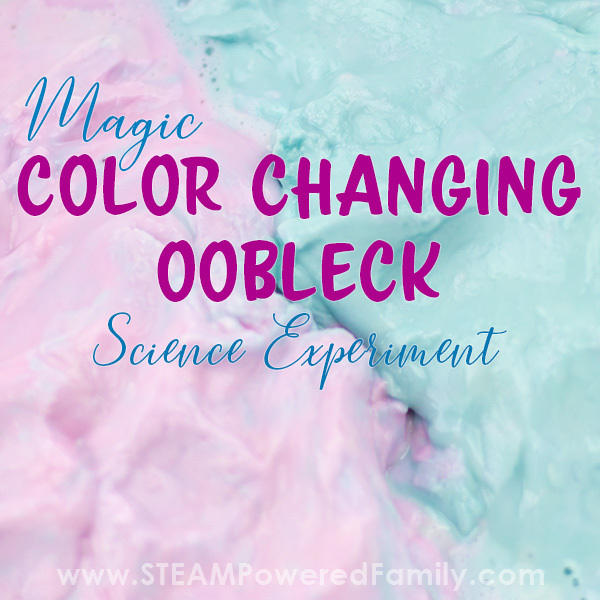 1 – We created a colour changing oobleck recipe. 2 – We created a glow in the dark oobleck recipe with two types of glow. 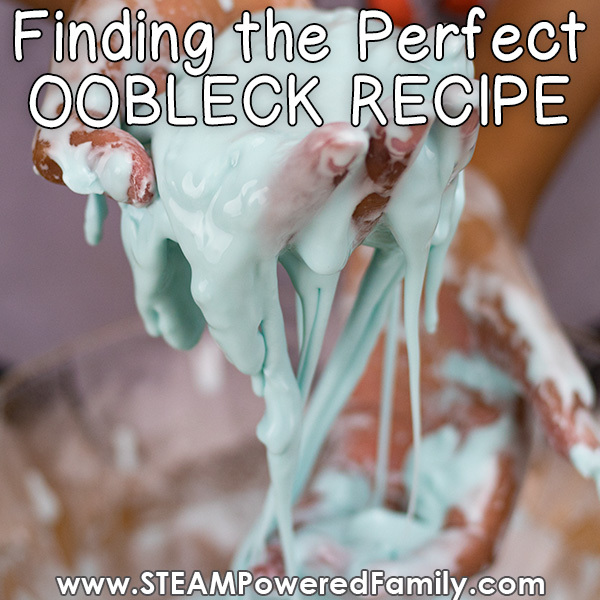 This time we decided to go back to basics and examine our oobleck recipe. Our goal is to see what other ingredients will work in the creation of non-Newtonian fluid and judge the properties of each one to see if any one ingredient is superior and would result in the perfect oobleck recipe. For this investigation we have two variables, the liquid and the solid. We decided to keep our liquid the same and use water (with food colouring so we can keep track of which oobleck was made with which ingredient) for each batch. We already explored making oobleck recipes with liquid other than plain water in our previous two investigations. The variable we are changing (and studying in this project) is the solid. Our plan was to start with the same 2:1 ratio recipe and alter as needed to create a non-Newtonian Fluid (if possible). Then we would explore and test each batch to see how the properties of each one varied. But before we dive into the experiment, first we need to understand the science of Oobleck, also known as magic mud, goop, oobleck slime, and of course to our science minded folks, a non-Newtonian Fluid. Issac Newton had a number of theories around fluid dynamics. With oobleck we have a non-Newtonian fluid because it doesn’t follow Newton’s Law of Viscosity which states: the shear stress between adjacent fluid layers is proportional to the negative value of the velocity gradient between the two layers. So let’s dig into this science a bit and see if we can make some sense of it. 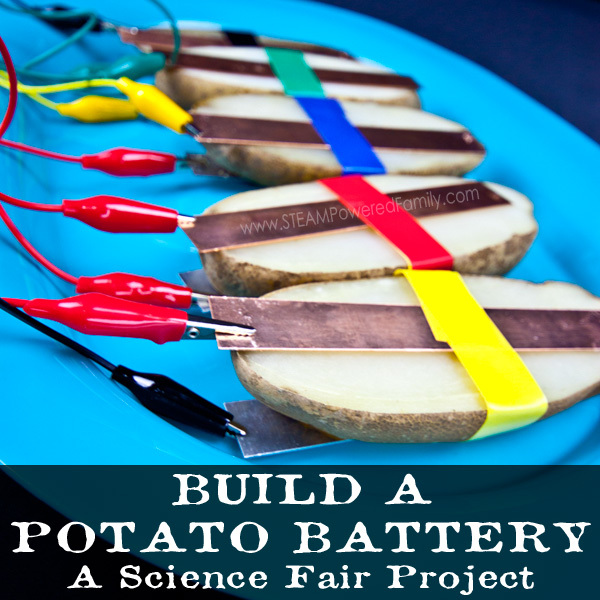 This is important stuff if you are presenting a science fair project! So when we are looking at Newton’s Law of Viscosity we are discussing how fluids react due to the friction created between the molecules when flowing. If there is a lot of friction, it is a thicker liquid and has a higher viscosity. Then there is our beloved Oobleck, a non-Newtonian fluid, that breaks all the rules Sir Issac Newton so carefully crafted and proposed. 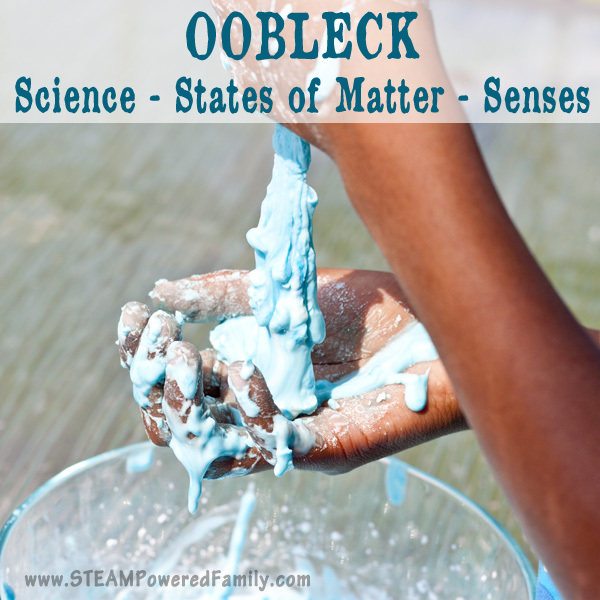 States of Matter – Is Oobleck A Solid or A Liquid? If you have ever played with oobleck you know it doesn’t behave the way you would expect at all. When you apply force to oobleck it becomes a solid. You can actually walk on it, or mold it like play dough, as long as you keep the force up. In fact it becomes so solid and hard that I actually broke a finger nail on oobleck while doing this investigation! But then something a little magical happens. As soon as you release the force and pressure, it turns into a flowing liquid. If you are walking on it and stop, you will sink. 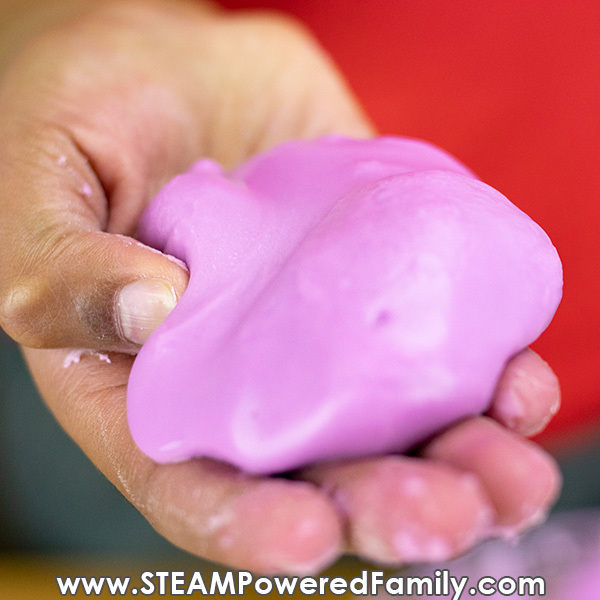 If you are squishing it like play dough and relax your hand, it will flow through your fingers. This phenomenon is called “shear thickening” and it occurs in materials made up of microscopic solid particles suspended in a fluid. Oobleck therefore is a suspension. The solid molecules are not dissolving in the liquid, they are simply suspended. When you make oobleck you will see it quickly separates. The suspended molecules settle to the bottom and the liquid rises to the top of the container. Want to know more about the study of shear thickening? Check out this article. Pro Tip! If you have kids that need some finger strengthening exercises, give them a batch of oobleck with some items hidden in it. It will give them a great finger workout! It is also a great way to work on “gentle” fingers, because the harder you push, the more solid oobleck becomes. 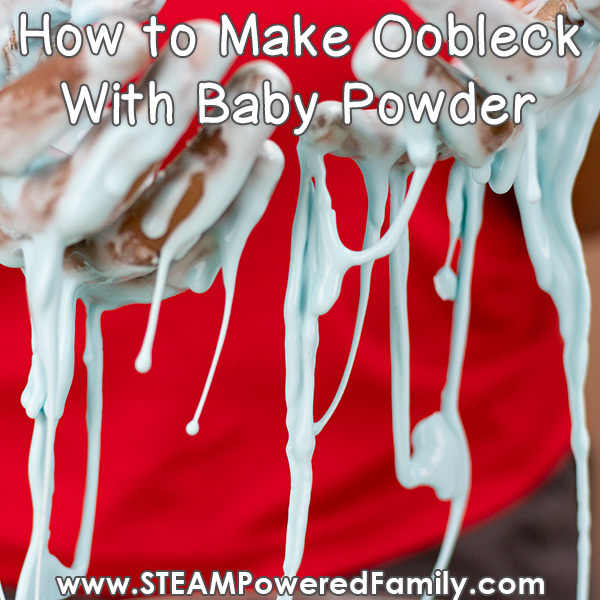 Gentle fingers and pressure are the key to working your way through Oobleck. How Did Oobleck Get Its Name? Although this non-Newtonian Fluid goes by many names, including magic mud, goo, goop, or the most common name is Oobleck or Oobleck Slime. But where did the term “oobleck” come from? In fact it was created by none other than Dr. Seuss. 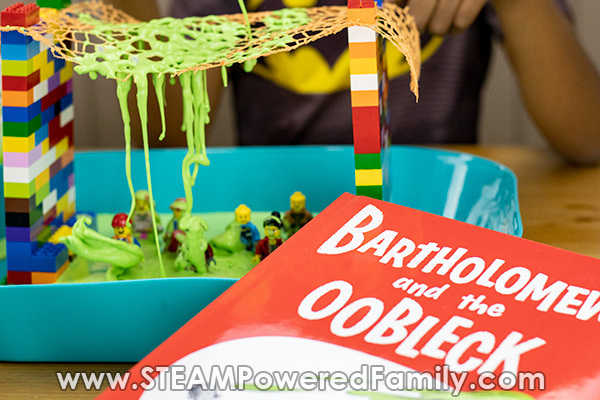 Back in 1949 Dr. Seuss wrote a book called Bartholomew and the Oobleck. It is a story about a king who was bored with the weather and asked his team of magicians to create something new to entertain him. The result was this gloopy, sloppy, sticky substance that rained down from the sky on the unsuspecting villagers. A substance that had a lot of properties in common with our beloved non-Newtonian Fluid. It may not have been intentional, but it is a fantastic story of how this magical substance got it’s name. So now we know a bit about the history of Oobleck and how Oobleck works, it’s time for some science! Our goal with this study was to explore different recipe variations for oobleck to see what works and if there was a difference in the resulting oobleck. And we were really surprised by the results! Our hypothesis was that Baby Powder and Potato starch would make oobleck, we were not sure if the other ones would work, but we predicted if one “flour” worked, they all would and that there would be little difference in the properties of the resulting ooblecks. We kept our procedure quite simple, we made a LOT of oobleck and played with a LOT of oobleck. For this investigation we have two variables, the liquid and the solid. We decided to keep our liquid the same and use water (with food colouring) for each batch. This makes it our controlled variable. We used food colouring so we didn’t get confused about what ingredient each oobleck was made with. Our independent variable, or the one we are changing, is the solid. Our plan was to start with the same 2:1 ratio recipe (2 cups solid, 1 cup water) and alter as needed to create a non-Newtonian Fluid (if possible). Then we would explore and test each batch to see how the properties of each one varied. Our outcomes would be measured based on a successful non-Newtonian Fluid result (solid under pressure, liquid without pressure). We would also do some observations to see if there is any variations in the properties of the oobleck when made with different solids. 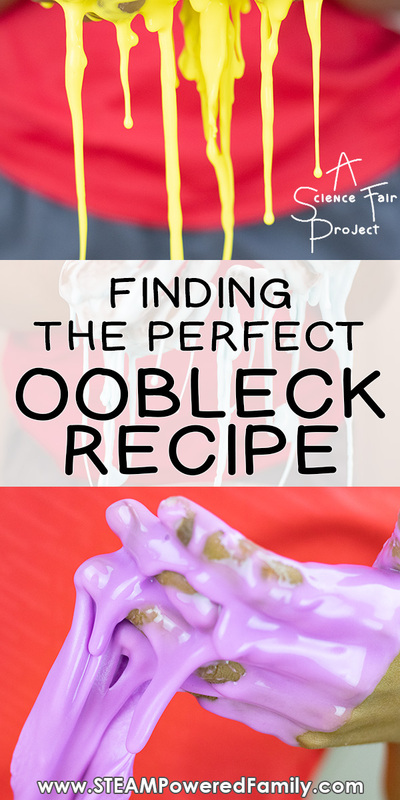 Check out our video comparing all the different recipes that created oobleck! Click on the images to go to an article specifically on each ingredient. This is the standard recipe ingredient for oobleck that we have always used in the past. It was used as our basic recipe to which all other recipes were compared. 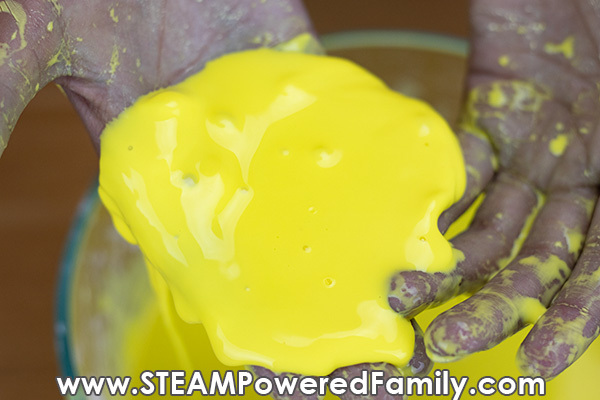 You can get more details on our cornstarch oobleck here. Click here for a look at our Baby Powder Oobleck in detail. We discovered that baby powder made an oobleck very similar to our regular corn starch. There are two types of baby powder – one uses talc and one uses corn starch. Talc is not used as often now due to some health issues discovered with it. 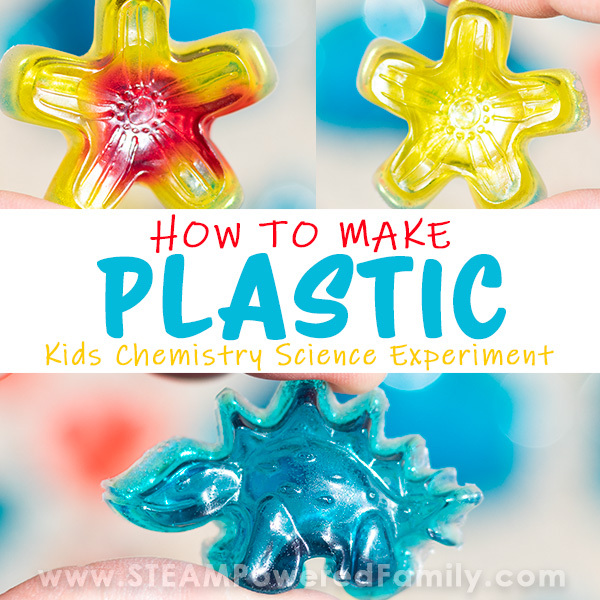 If you try this experiment, check to see if your baby powder is a corn starch base. If it is, it will make oobleck comparable to our regular oobleck recipe. This one just smells like a baby bum. For this test we used regular baking flour made from wheat. And it didn’t work. There was no non-Newtonian action at all. I am actually surprised at this (due to our other results) and had to go do more research to understand this result. More on this in a moment. Using baking soda to make oobleck in the place of corn starch did not work. It simply became a paste. However, if you want to use baking soda in a fascinating oobleck experiment, check out our colour changing oobleck. Click here for a look at our Arrowroot Flour Oobleck in detail. Arrowroot flour is also known as Arrowroot Starch. This was an interesting result. I was able to make non-Newtonian fluid, but it required different ratios. I had to really decrease the water. For 2 1/4 cups of arrowroot flour, I added only 2/3 cup of water to create our arrowroot flour oobleck recipe. The resulting oobleck had some slightly different properties from our regular oobleck too. It REALLY responded to pressure. Which means it became clumpy and hard very easily. Even when “flowing” when we released the pressure, it would form clumps and lumps as it fell. Far more than our cornstarch oobleck recipe. 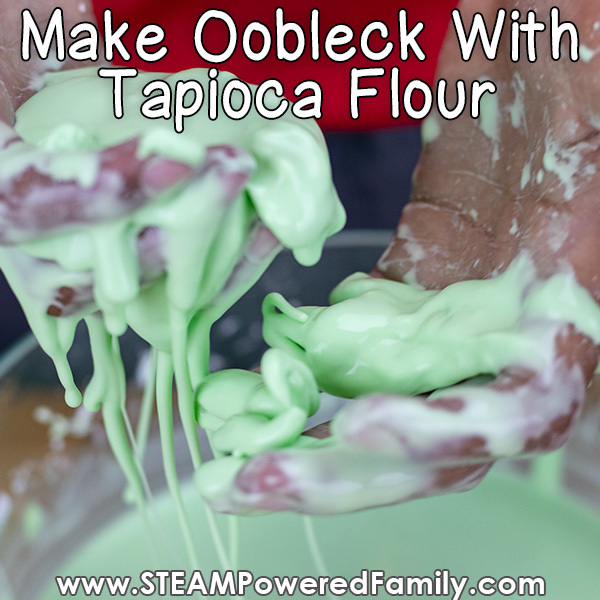 Click here for a look at our Tapioca Flour Oobleck in detail. Again, Tapioca Flour is also known as Tapioca Starch. It had similar results to Arrowroot. Once again we had to change our ratios and create a different recipe. We used 2 1/4 cups of Arrowroot Flour and 1 cup of water. Tapicoca Flour Oobleck also had some interesting properties. It became very hard when solid. I actually broke a nail while trying to scoop some up. It almost feels dry and crumbly when under pressure and solid, but when the pressure was released it still flowed. Click here for a look at our Potato Starch Oobleck in detail. This time we were able to successfully make oobleck from potato starch using our standard ratio – 2 cups of potato starch to 1 cup of water. It made a wonderful oobleck, but there was a striking difference. Potato starch oobleck is incredibly silky and smooth. It lacks the sticky, goopiness of the other recipes. It is very luxurious to play with, and honestly very hard to stop playing with. The texture is simply incredible. 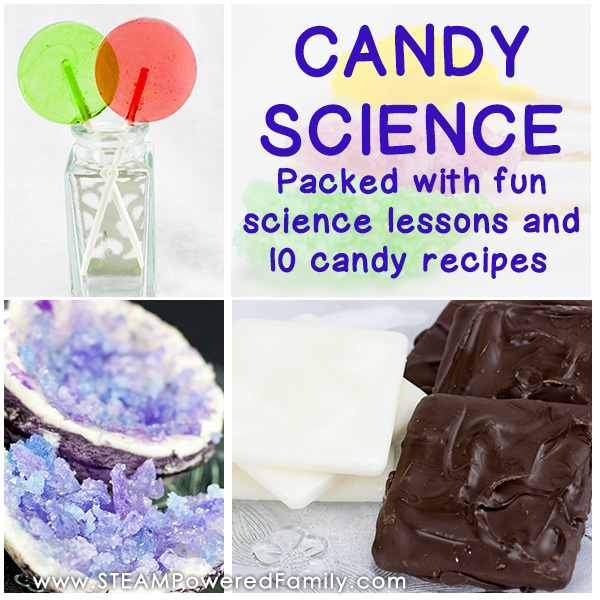 When it comes to making oobleck there are actually many recipe ingredient options. We did have one result that surprised me though. My initial research showed that wheat flour has similar properties to cornstarch, arrowroot flour, tapioca flour and potato starch. So our hypothesis was that flour would give a similar result to our other “flours.” But it didn’t. It simply formed a paste. However, after seeing our results I did more research (it may be similar from a cooking perspective but obviously from a science perspective there are differences!) and I believe marketing and branding/naming may be where things got confusing here. Grain flour is milled and starch is part of flour, but through other processes you can extract pure starch. Pure starch interacts with water differently (hence our non-Newtonian fluid) than flour. So although our bags were labelled as Arrowroot flour and Tapioca Flour, I believe they are truly pure starches. So based on our study, if you want to make oobleck without cornstarch you have a few viable ingredient options for your oobleck recipe. You can use Baby Powder (the type with a corn starch base), Tapioca Flour (Starch), Arrowroot Flour (Starch) or Potato Starch. What Is The Best Oobleck Recipe? Without a single doubt, nothing came close to the potato starch oobleck recipe. 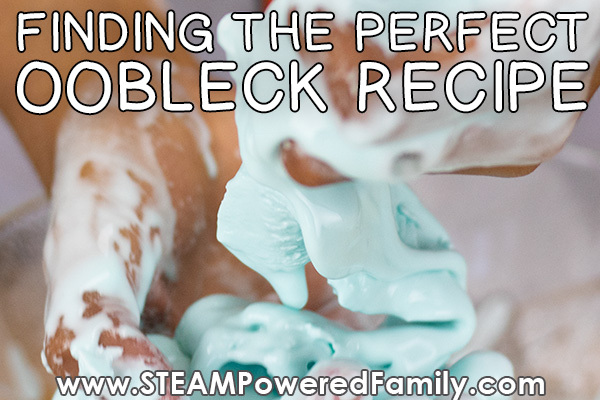 The texture is silky luxury, yet it still has the fascinating non-Newtonian Fluid properties we love in Oobleck. The combination just begs to be played with, creating an irresistible substance everyone will just want to get their fingers into. Is Oobleck Toxic? Can you eat it? Oobleck is absolutely not toxic. In all of the recipes we tested, we used ingredients from the pantry (with the exception of baby powder), and as such is taste safe and technically you could eat it, but why would you want to? I really don’t know. But if your little one is playing and licks their fingers, you don’t have to worry. Just a reminder that Oobleck is a suspension, which means the molecules will separate form the liquid as it sits and fall to the bottom of the container (with the liquid floating on top). You can just mix it up again before playing. If you want to save your oobleck for a day or so, make sure it is kept in an airtight container. Similar to slime and other hands on sensory items, I don’t recommend keeping these for long periods of time. Especially if you have multiple kids playing with it. These mediums are great breeding grounds for bacteria and other nasties. So make it, play with it, and toss it. Then simply make a new batch next time you want to play. Safety always comes first and I prefer to err on the side of caution when it comes to these inexpensive sensory experiences. Especially when they are so quick and easy to make. Or if you want to play with your oobleck again, simply add water. 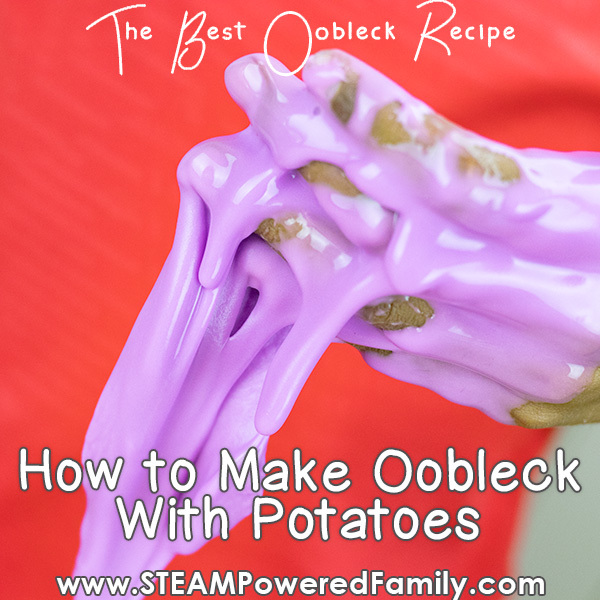 Previous Post: « How to Make Oobleck Slime from Potatoes – The Best Oobleck Recipe!